"Not that I love to be cold, but it's no secret that I perform well in bad weather. The worse the weather, the fewer riders remain in the final. And that's good for me. It is the race that should suit me best." Tim Wellens hopes Liège-Bastogne-Liège is the Ardennes Classic that finally reards his attacking style. "I hope we go to the finish line with less riders," said the 24 year old Belgian to Het Nieuwsblad, who is Lotto-Soudal’s number one leader come Sunday. Both in the Amstel Gold Race and the Flèche Wallonne Wellens made himself popular by attacking early. "Everyone has their strengths. If I was the fastest up the Mur or Cauberg, then I would wait too. But I have to do it in a different way. Fortunately, the team has a soft spot for attacking riders. A bit of gamble. I make myself popular in this way with the fans, but the result is key. And I hope to win on Sunday. " Wellens is really intereted in the weather report, saying he is keen on bad weather. "Not that I love to be cold, but it's no secret that I perform well in bad weather. The worse the weather, the fewer riders remain in the final. And that's good for me. I also hope that more riders choose to attack. It is the finest, the toughest and the race that should suit me the best." Also in the Flèche Wallonne, Wellens showed his excellent form. "Tim has in recent races shown that he is the best. At present he is one of the most attractive riders in the peloton. 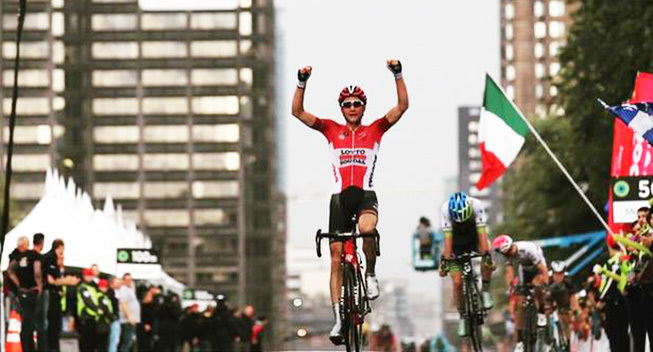 His way of racing has twice won him the Eneco Tour and also the Grand Prix Montréal." Sergeant also needs bike rides from Jelle Vanendert and Tony Gallopin, even if they aren’t outright leaders. "They have their chance. They can be used to break open the race. And that is possible on Sunday. Liège-Bastogne-Liège is still a separate event and the weather can play a big role." Sergeant came during the press conference also went back on the criticism of Wellens on the team tactics in the Fleche Wallonne. "I never said that Tim had seizures before. He just anticipated what he saw at that moment. It was mostly a good move by Movistar to send forward Izagirre. Tim was when his digs. But we are still all going in the same direction."